Helsinki is full of possibilities from cultural services to hobby activities. By means of different kinds of leisure and cultural services, the City wants to support the mental and physical well-being of its residents, active citizenship and education. Information about the services is published openly on the web and many data sets are also available as open data. The Helsinki Loves Developers meeting in November 2018 focused on the open data and the data that could be published as open data in the City of Helsinki’s Culture and Leisure Division, and on the utilisation possibilities of them. One goal in the City of Helsinki’s strategy is to be the city in the world that best capitalises on digitalisation. In the digitalisation vision of the culture and leisure division, Helsinki is the most functional city in the world in terms of culture and leisure, says ICT Development Director Joonas Pekkanen. According to Pekkanen, in Helsinki it is easy to develop future solutions in close co-operation with non-profit and commercial partners. Joonas Pekkanen presents the digitalisation vision of the City of Helsinki’s culture and leisure division. Photo: Tanja Lahti. One of the measures in the Digitalisation Programme is opening all the division’s public data. The division follows the open by default principle: if there are no reasons to keep the data closed, it will be opened. The principles also include, for example, development of open source code, co-operation with developers outside the City and making flexible and scalable solutions. The division is also working on a Helsinki mobile application, which makes it easier to take care of things with the City and possibly replaces customer cards, such as the library card, in the future. Also under active development is the oma.helsinki service, which offers a user profile in accordance with the MyData thinking and enables a city-wide customer profile – each user’s data is asked for the service only once and the user has control over his or her own data. In Linked Events, the event data is saved in one system in the same format. The data is easily obtainable through the open API and freely usable in different kinds of applications, including those created by people from outside the City. 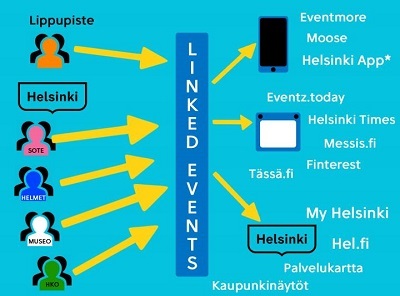 Information about the numerous events organised by Helsinki can be obtained through the Linked Events API. Through the API, it is possible to get information both on the City’s own events and on events organised by others and picked by the marketing team. There are around 300 events per day, about 100,000 in total. The system has also accumulated historical data since 2014. 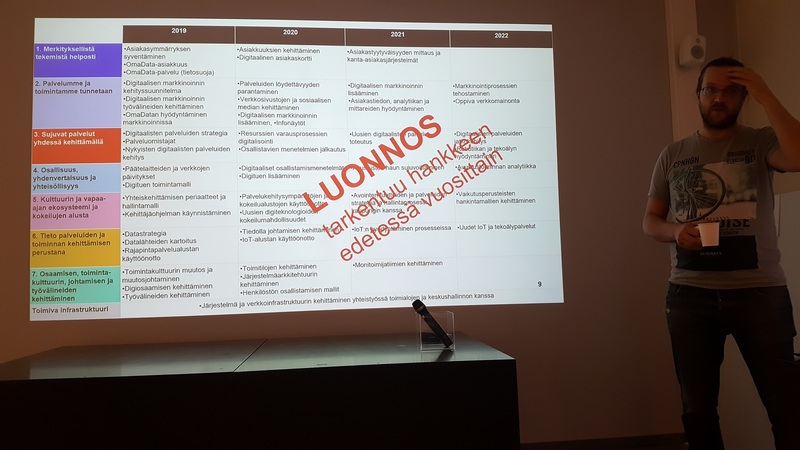 Linked Events is currently used in around 15 different applications, such as information screens, the Service Map, Eventmore and other (mobile) applications coded by people outside the City, tells Aleksi Salonen at the City Executive Office. In the Service Map, the City utilises the same open API which is offered to external parties, which ensures that both the quality of the data and the usability of the API remain at a good level. The data model and technology of Linked Events is being used for the development of a Linked Courses API, through which the user can get information about courses arranged by different city actors, tells Joonas Pekkanen. Now in the beta phase, Linked Courses has two importers, one from the Activity Search service and the other from the system used at Kulttuuritalo (Hall of Culture). In the future, for example the Adult Education Centre’s course information will be brought to the system through the API. Course information can be brought to the system from other cities as well, which is why it could later cover even the whole Finland. The goal is to expand the usage of the API and publish it in HRI’s data catalogue before the end of the year. Besides the Linked Courses API, the adult education centres of the Helsinki Metropolitan Area are currently updating their joint Ilmonet system. In connection to the update, the information for thousands of courses, lectures and events will also be made available through the REST API, explains ICT Specialist Pertti Koskela. Information about the lectures and events will also be imported to Linked Events in the future. An API key is currently needed for Ilmonet’s API, but in the future, it will be possible to offer data without an API key at least through Linked Courses. At the event, the developers hoped that it would be possible to at least test Ilmonet’s API in the future as well, if not even use it without an API key, as acquiring one increases the threshold to start testing the API. Information about sports services maintained by the City, such as ski tracks, ice-skating rinks and beaches, is available through the newish Outdoor Exercise Map. The map includes both the locations and information on the condition of the sports sites. Last summer, many searches were made concerning the cyanobacteria situation on the beaches, tells developer and coder of the map Timo Tuominen at the Helsinki City Executive Office. The Outdoor Exercise Map is made out of open data and open APIs and it is based on the API of the Service Map for the Helsinki Metropolitan Area. The further development plans include, for example, crowdsourcing of the data collection, such as ski track condition data updated by the skiers. The participants also suggested that the ski track information could be established with video-based pattern recognition. IoT sensors could also be used for collecting data at least concerning beach water temperatures – possibly also about the condition of the ice in the ice-skating rinks. Forum Virium is already carrying out some tests to determine the water temperature with sensors. Open cultural data was utilised at the Hack4FI event in the beginning of October 2018, tells Aki Pohjankyrö at the Helsinki City Museum. A hundred participants registered for the event arranged for the fourth time – a record number of participants interested in interprofessional co-operation and creative reuse of cultural data. During the weekend, citizens and international guests came up with 18 new concepts, services and works based on open data for everyone to use. The installation that received the most audience votes Into the Wild Box, was inspired by a box of matches carried along by composer Jean Sibelius. Students of Helsinki Metropolia University of Applied Sciences have tested and used a beta version of the Linked Courses API in their software development course in autumn 2018. The course includes an innovation project, which brings together e.g. students of industrial engineering and information technology and exchange students. The starting point was to make an application which encourages young people to increase their engagement in hobbies. Two groups, Team Pi-map and Team HaHae, presented their works at the developer meeting. In Team Pi-map’s application idea the young people can create events and activities in the map view, invite their friends to them and ask for permission to participate in events created by others. Team HaHae created an application concept, where trying out hobbies was gamified and the young person can collect points, for example, by trying out hobbies recommended by the chatbot and participating in courses. The points can give small rewards, such as free visits to indoor swimming pools. Thanks to all participants of the developer meeting!